It's hard to believe that December 31st has finally arrived and it's the last day of 2017. I don't know about all of you but I feel that 2017 was a rollercoaster of a year. DNA tested paternal uncle and father at AncestryDNA. Bonus was my maternal grandmother tested on her own at MyHeritage. Attended two genealogy conferences, RootsTech and NERGC, which were both firsts for me. Had proposals chosen to give lectures at Ontario Genealogy Society (OGS) Conference and Michigan in Perspective Local History Conference in 2018. 9. Continue education through conferences, webinars, etc. What are your genealogy goals for 2018? Tonight is the first night of Chanukah. In short it's a celebration of how the oil needed to heat the menorah of the Temple lasted eight days, when it should only have lasted one day. Growing up, I was raised to celebrate both Chanukah and Christmas. My mom was raised Jewish and my dad was raised Catholic and holidays were blended. My mom would make the potato latkes (pancakes). The menorah would be lit, with a new candle appearing each night until the final night when the entire menorah has candles. The menorah has candles added right to left but it's lit left to right. 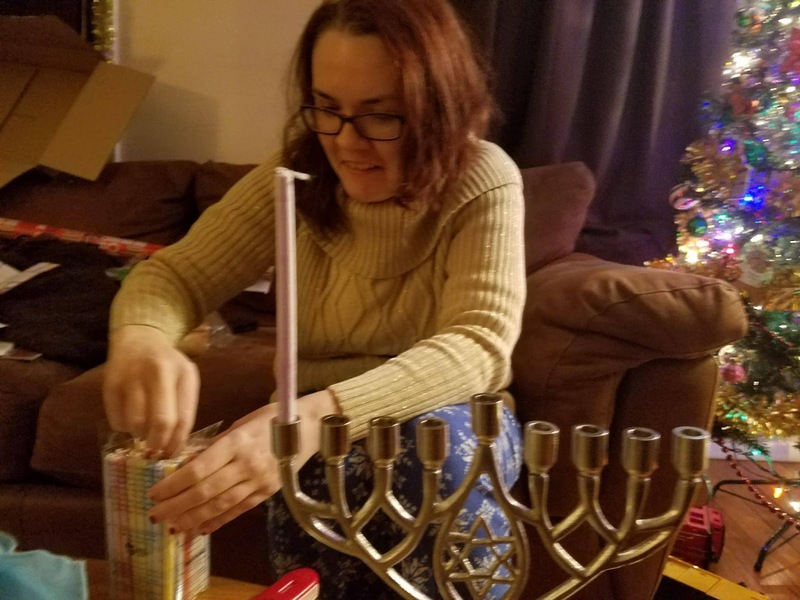 I was usually afraid of fire so my mom would take care of lighting the menorah. In some families it was the youngest child that would do the lighting. 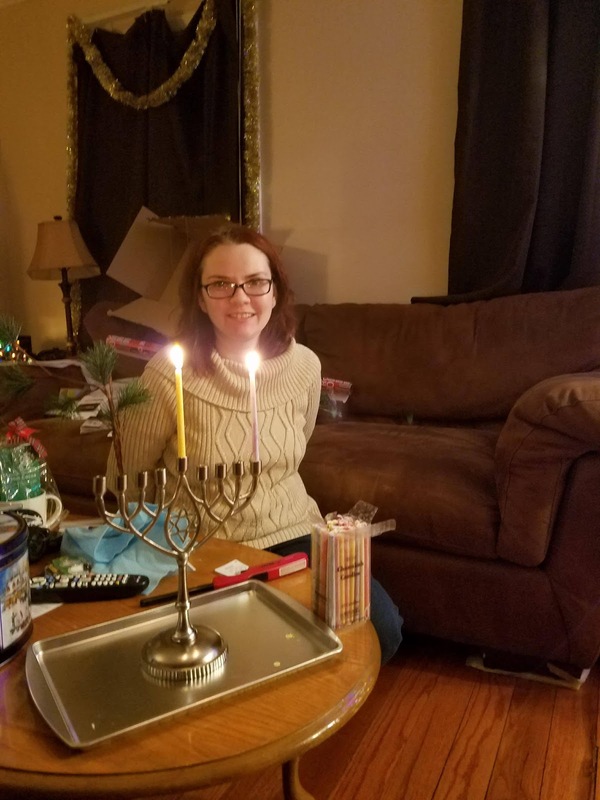 The menorah in my family was passed down, possibly from my great grandparents. I loved the menorah, it had such a bright bronze (almost gold) look. It played "Rock of Ages", like an old jewelry box tune. Since I moved out of my parents' house, I didn't celebrate Chanuakah. 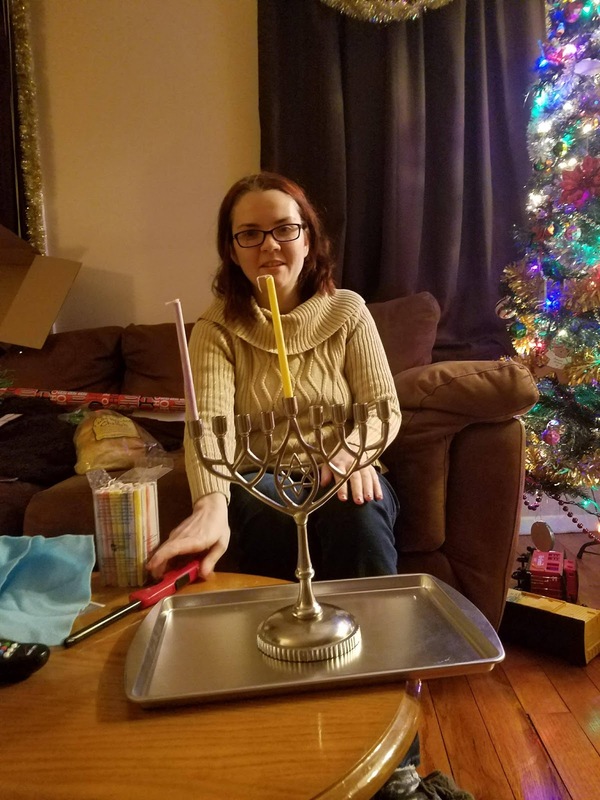 There was no menorah in the house. I think I felt disconnected from my heritage. I was raised reform Jewish so I didn't consider myself overly religious. There were no prayers uttered over the menorah growing up. I think I partially felt afraid to say to people that I was Jewish. I grew up in community that had a heavy Christian presence, which is sometimes hard to believe given it was Long Island, NY but it wasn't the most Jewish heavy town. Most of my peers were Roman Catholic or other Christian sect. There was only a handful of us that were Jewish. I felt like an outsider even though I celebrated Christmas as well. I was told things like "You killed my savior" or people would give the Nazi salute or talk about how Hitler had good ideas. Really awful things to hear growing up, esp, since I've heard stories that I have some distant cousins that were murdered during the Holocaust (still to be proven). This year I decided it was time to reclaim family traditions. There is now a menorah in my household and we lit candles tonight and ate potato latkes with our dinner. I even had a challah bread. You can see some pics below of myself lighting the candles. I'm reclaiming my Jewish heritage. I am Jewish - it's one part of my identity. I think given these dark times in our country that celebrating a miracle gives us hope for the future. Happy Chanukah my friends - may the darkness be behind us soon. And to all that don't celebrate, happy holidays! May your time with family and friends be loving and bright.